This page explains how to use and configure the patient quick list tool. What is a Patient Quick List? A patient quick list is a list found under the Main Menu of the Patient's Chart tab. There are two types of patient quick lists: one to display the daily schedule and one to display the most recently opened patients. Quick lists that display the daily schedule will display the schedule for any user, room or provider who has the Allow Scheduling option set to True on their demographic information. Patient Quick Lists must be configured prior to initial use. 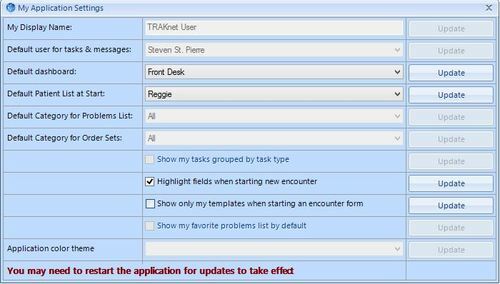 They must also be configured with each new addition or removal to the scheduler in TRAKnet - that is, every time a new provider starts or a provider leaves, the user must re-configure their quick lists to add the new provider or remove the old provider. Log into TRAKnet 3.0. Click Help. 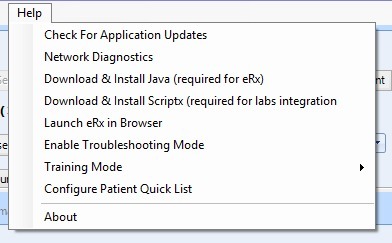 From the Help drop-down menu, select "Configure Patient Quick Lists." You will receive a message indicating this is complete and you must log out and log back in again for these lists to be available. Restart TRAKnet at this time. 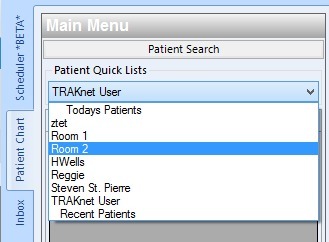 Click the drop-down menu under the Patient Quick List header in the Main Menu to view the available quick lists. Providers, Users or Rooms with Allow Scheduling set to True. Recent Patients which displays the 25 recently opened patients. The recent patients quick list will display the 25 most recently opened patients. This quick list is called “ Recent Patients.” Once a 26th patient record is opened, the 1st will be removed from the list. The most recently opened patients will be at the top. If the list does not appear to be updating automatically, click the green refresh button to force a refresh. To open a patient's chart from the patient quick list, click on the patient's name to open their chart. Patient quick lists can be defaulted on a user level to ensure that user is always seeing the quick list they would like to see. To do this, click on the UserName in the right-hand corner of TRAKnet, then select My Settings from the drop-down menu. Under "Default Patient List at Start," select your desired default list from the drop-down menu, then click Update. Note: You will need to restart TRAKnet for this to take effect.